A solid batting performance by the Englishmen in the second innings well led by Nick Compton and their skipper, Alastair Cook, drew the first Test vs. Kiwis. England went out cheaply in their first innings for 167 but they forced their way back in the second by smashing 421 runs for the loss of just six wickets. New Zealand performed excellently with the bat, hammered 460 with one wicket remaining and declared their innings after 116.4 overs. 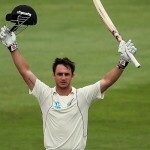 The first Test of the three match series concluded on Sunday, March 10, 2013, at University Oval, Dunedin. Earlier, England started the day at 234 in 87 overs with nine wickets in hand whereas Nick Compton and Steven Finn were unbeaten at 102 and 0 runs respectively. Finn and Compton hit a couple of fours in the early part of the game and reached 256 after the completion of 100 overs. Nick Compton was declared leg before wicket off Neil Wagner for 117 from 310 balls with 12 fours on the first delivery of the 104th over. Jonathan Trott came in next and accustomed himself to the conditions while hitting 2 fours as Finn was going well at his side and the third hundred of the innings appeared on board in the 112th over. The surface looked perfect for the batting and the duo was enjoying at the crease while playing their shots at will. Trot was the most impressive of the two batsmen and was sending the ball out of the fence at regular intervals and attained his 14th Test fifty with a four in 78 balls on the fourth ball of the 128th over. Steven Finn got his maiden Test half century on the first delivery of the 133rd over as Trott became the third victim at 52 off 94 with 8 fours. Kevin Pietersen dropped in next, he could not adjust himself at the wicket and was gone after scoring just 12 runs. Ian Bell joined in next with Finn who slowed down a bit after his fifty and was held lbw off Bruce Martin for 56 off 203 balls with 5 fours. Joe Root was run out unluckily without opening his account and was replaced by Matt Prior. Bell and Prior played sensitive cricket and occupied the crease for 26 and 23 accordingly as England thrashed 421 with four wickets still in hand at the end of the 170th over when the play was finally called off. Neil Wagner was the top wicket taker with three whereas Trent Boult and Bruce Martin shared one wicket each. The first Test between the two teams ended in a draw and they will face each other in the second match which will commence from March 14, 2013, at Baisn Reserve, Wellington.